Kids will appreciate attractions like Bellevue Beach and Teijo national park. 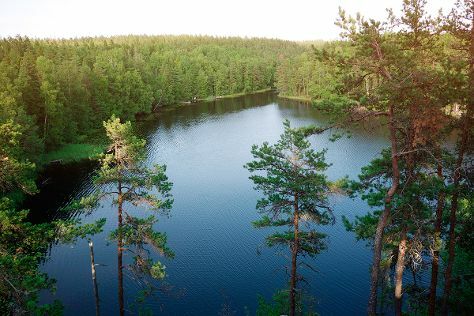 Step out of the city life by going to Nuuksio National Park and Tapiola Golf. The adventure continues: brush up on your military savvy at Sea Fortress Suomenlinna, take in the spiritual surroundings of Rock Church, wander the streets of Ullanlinna, and pause for some serene contemplation at Helsinki Cathedral. To find maps, traveler tips, where to stay, and tourist information, refer to the Helsinki trip builder site . If you are flying in from United Kingdom, the closest major airport is Helsinki Vantaa Airport. In May, daytime highs in Helsinki are 18°C, while nighttime lows are 7°C. 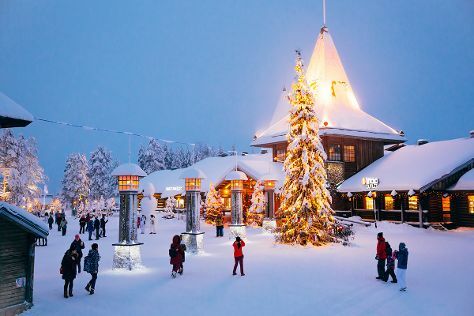 Finish up your sightseeing early on the 27th (Mon) so you can travel to Rovaniemi. Kick off your visit on the 28th (Tue): get in on the family fun at Santa Claus Village and then take an exotic tour of a safari tour. On your second day here, take an in-depth tour of Arktikum and then find something for the whole family at SantaPark - the Home Cavern of Santa Claus. To see traveler tips, reviews, more things to do, and other tourist information, use the Rovaniemi trip itinerary planning tool . You can fly from Helsinki to Rovaniemi in 4 hours. Other options are to do a combination of flight and train; or drive. Expect a bit cooler temperatures when traveling from Helsinki in May; daily highs in Rovaniemi reach 12°C and lows reach 3°C. Wrap up your sightseeing by early afternoon on the 30th (Thu) to allow enough time to travel back home.